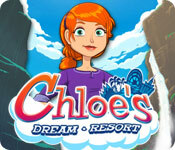 Chloe's Dream Resort is rated 4.4 out of 5 by 27. Rated 5 out of 5 by Hrobarka from Extremely glamorous game For Time Management games players really dream game. Dear characters, great gameplay, originality levels. I always return to this game. And I'm especially looking forward to winter landscapes, even if the others do not miss anything. Rated 5 out of 5 by kerith90angel from Based on full game play and some tips to get gold.... Geez, was I ever addicted to this game! I did nothing else it seems, until I'd gone back and tried to get gold for every level. COOLEST THING! If you end up getting gold for each of the 12 levels of that resort you will UNLOCK A WALLPAPER! Another reviewer at BFG had it as their favorite TM game so I thought I'd try it, so glad I did! This game has a LOT of dragging customers. You even drag them to the cash register. At times they don't always want to stay in the dragged spot too, but the more you play the better your accuracy will become. This game has a resort at 5 different places. Each place has 12 different levels. Basics are placing a person into the resorts room, and completing fun tasks specific to that location, as they vacation. You will also feed and give drinks at all locations. part 1- A ski resort. There is a hot tub, a bonfire, and ski lift for the skiers. part 2- A beach resort. There are surf boards, a submarine ride, and lounge chairs. part 3- Slumber falls, hot springs resort offers river boat rides, a pool tub and lounge chairs. 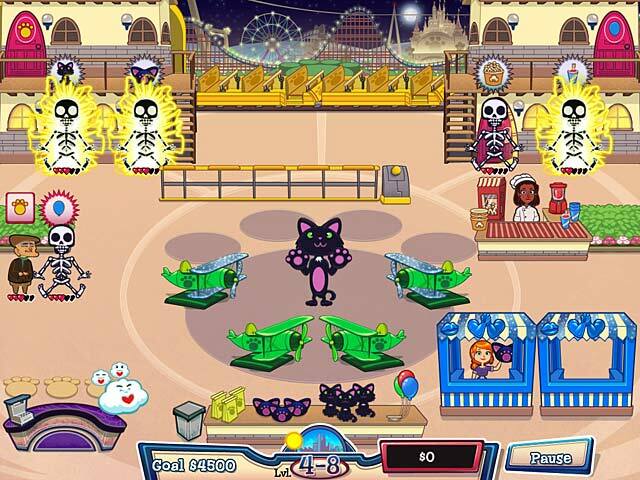 part 4- Cat nap studios Amusement park resort- has a roller coaster ride, kissing booths and other rides. part 5- Casino resort offers gaming tables, a dance floor and a lounge area. Tips for getting gold for each level. ~ I played the game through all 5 parts/levels and CAME BACK to the levels one by one to obtain gold. Just before the end of the last levels at the Casino go back before the credits roll. You will probably want more practice before those end levels anyway. The best thing is, as you continue getting gold for each level you are obtaining more money to purchase the rest of the upgrades maybe you couldn't afford with your first try at that level. That was brilliant because so many games will just stop giving upgrades but this one doesn't. ~ 9 times out of 10 if you drag a person to a spot, there will be a task for that same person as soon as you've accomplished the first. So I would usually double click each person. ~ Pay close attention to the sites and sounds of the monsters. If a monster zaps you restart the level if you are trying to get gold. The bushes will make a sound and it is easier to listen for the monster then see him. He usually will come out in groups of 3. 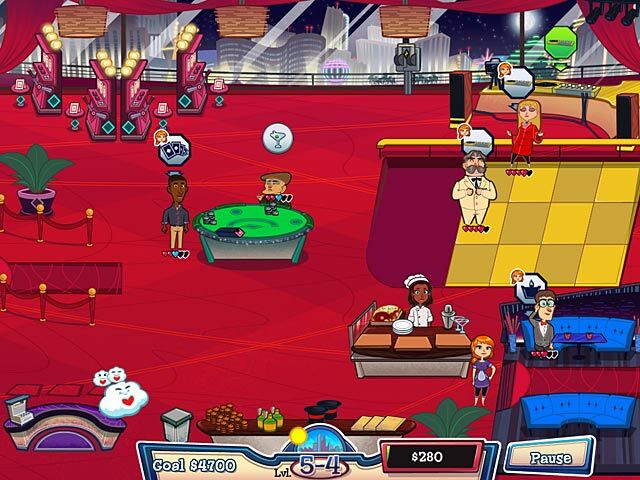 By the Casino level 5/8 to 5/12 were really hard levels. Keep at it! ~Try to handle people as groups in a certain area so she doesn't have to race too far away from 1 task to the next. ~ Each level you will be purchasing upgrades. Pay attn. to WHAT you just upgraded and be sure to put customers in those special spots. ~CLOUDS- At some point you will upgrade to buy more "happy customer" clouds. If you haven't used all your clouds by the end of the level hand them all out to your customers standing to pay. If you like this game you will probably like: JET SET GO. Also a super fun TM game. I'll add it as a link to this one. I hope I helped you get those wallpapers!! I am SURE I will play this game over and over. Thank you to its Dev. and BFG for so many hours of fun! Rated 5 out of 5 by SumrBrz33 from Awesome TM Game !!! I wish there were more TM games like this one. Really fun, just the right amount of challenge, good graphics, good storyline.. Make sure to play this game .. you won't be disappointed! Rated 5 out of 5 by JanBella from Good game to play I play it a few times already and like it. Rated 5 out of 5 by Tina_TX_W77 from Always something New! LovedLovedLoved..that you go to new places and do new things , more challenging the higher lvls you get. Very cute and fun game you can sit and play all the way through. Rated 5 out of 5 by sparklefish777 from Relax at the Resort! This game is so much fun. Basically, you get to play at five different themed resorts. The first is a winter resort and each resort has 12 levels. Because your character is dreaming, there are different monsters you have to zap before they irritate your guests. Guests enjoy different activities such as eating, riding the ski lift, soaking in the hot tub, and roasting marshmellows on a bonfire. The guests are very cute characters. They get angry if you make them wait too long for a service, so you need to be quick! The graphics are bright and cheerful. It would be awesome to have a second in this series! Rated 5 out of 5 by MarsRose from One of my favorites! I'm currently replaying this game and realized I didn't review it yet! This is one of my absolute favorite time management games. You have to manage a dream resort (where 'dream' has to be taken literally), and help customers visit all 5 different areas of the resort in order to make them complete their sleep cycles, so they can wake up fully refreshed. But nightmares are going to try to get in your way and upset your customers! The best thing probably is, unlike in other TMG where you change locations but keep doing the same things, here every location is absolutely unique, with not only a different layout but many different actions to perform. The only things that remains the same are the rooms to rent, because each locations has them. But the services (and food) you offer to your customers are always different and with each upgrades there are new and more expensive ones added. So it's really varied and never becomes dull. Every other level you'll have to take care of nightmares by clicking on them as soon as they appear or they'll upset the customers, making them lose hearts. When there aren't nightmares, you'll have to deal with other negative events like people turning into snowmen because of the snowstorm, or being covered by falling leaves or flying balloons, etc. The characters are funny and this make the tutorial funny as well, other than clear, as they keep interacting with each others instead of just giving you plain instructions. The story is original and cute. The only negative I can find is it's too short! But it has a good replay value thanks to the variety of the locations, so it's okay. But it would be great to have a sequel or similar games. Rated 5 out of 5 by 5micky from Fun Game Interesting levels, fun graphics. Wish there were more levels or hidden levels with perfect score. Rated 5 out of 5 by Lolaliloo from ^_^ yay!!! Love it love it!!! want too see more games like this one..i am a big fan of the Emily series, and that one totally reminded me of the Emily game play, (if you need a fix try it out) Lots of fun, various locations....wish a number 2 would come out :) Game on!! !